So, it's big, it's almost entirely empty, and there is hardly any illumination in most of it. But, let's talk about the arena, shall we? Peps is the man who made it, so the chances of litigation are slight. The room where you spawn is shown above. The sign you can see is also a doorway which opens when you approach, allowing you to jump through into the dark. It's a long way down, so you will kill yourself. 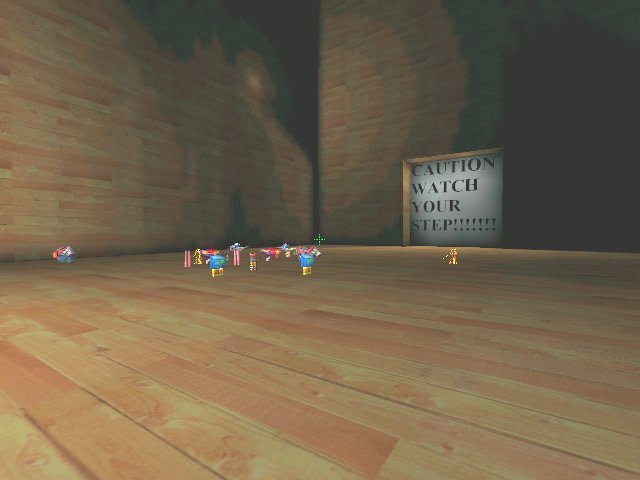 On the opposite wall is a sign advising you not to stand there - if you disregard that advice, you get teleported into the dark other room, pictured below. Better take a whomper and a scattershot and anything else that provides a little illumination, as the place seems large, and not very well lit - occasional tiny patches of faint illumination, is all. So, not a particularly great map for deathmatches. Fine to explore, especially if you know the "adminlogin" password for the server in question, but not a map that is likely to remain on many hard drives for very long.